ALL new materials, course resources, etc. are being posted there. This site will go away at some point. Please update your bookmarks. HAS BEEN CALLED THE CONSCIENCE OF AMERICA. 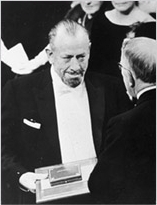 He wrote more than thirty books, won the Pulitzer Prize in 1940 for The Grapes of Wrath, and was awarded the Nobel Prize for Literature in 1962 and the United States Medal of Freedom in 1964. This website honors Steinbeck as a novelist, journalist, scientist, ecologist, historian, and social commentator. Sponsored by the National Endowment for the Humanities the Steinbeck Institute, "John Steinbeck, Voice of America, Voice of a Region," was held in 2007, 2009, 2011, and 2013. In 2016, the institute was renamed “John Steinbeck: Social Critic and Ecologist” to more clearly reflect its mission of exploring intersections between the humanities and sciences. The first part of the new Institute focuses on John Steinbeck the novelist, and the second part considers Steinbeck’s ecological connections. From July 1-20, 2018, NEH Summer Scholars will come to the Monterey Peninsula, two hours south of San Francisco, to study John Steinbeck's writing, his cultural impact, and the ecological vision he shared with marine biologist Edward F. Ricketts. The institute includes field studies in the Salinas Valley and on the Monterey coast.